Spanish centre-right and far-right parties joined forces on Sunday (10 February) in a demonstration aimed to force Pedro Sanchez’s socialist government to call an election. The protest was far from successful but what should worry all of us in Europe is that conservatives are now aligning with ultras. Around 45,000 people – a rather small number considering transport was provided from all corners of Spain – protested against the Sanchez government and demanded elections. Protestors called him a “traitor” for holding talks with Catalan separatists and contested his legitimacy as leader of the government. It is far from my intention to challenge anyone’s right to protests, as this is an essential part of democracy. But we should look carefully at who organised it and the narrative they used. The demonstration was the first public event where Popular Party (EPP), Ciudadanos (ALDE) and Vox (far-right) appeared together, after joining forces in Andalusia last month. Although they claimed it was a cross-party protest, they were accompanied by right-wing groups such as neo-Nazi organisation Hogar Social or fascist political party Falange, while none of the progressive forces joined. 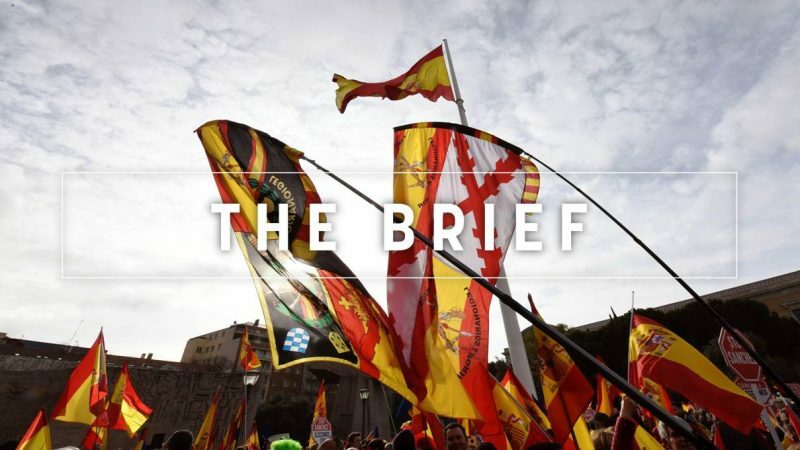 Demonstrators claimed to be defending Spain, its territorial integrity and the Constitution in a manifesto full of references to the nation and the homeland as something indivisible, indisputable – a very 20th-century narrative. Because fighting nationalism with more nationalism always worked perfectly fine in history. By the way, this goes for the pro-separatist movements too, as they have tried to force independence without even having a clear majority in favour. Just check what is happening in the UK with Brexit. Whereas the never-ending Catalan issue would require a separate article, the treason the protesters accused Sanchez of is this: He held talks with the Catalan separatist in an effort to find a way out of the conflict. Finding a peaceful solution to a political conflict through dialogue should not be a problem in a mature democracy, while discussing the appropriate format with all political forces seems mandatory. Furthermore, by contesting the legitimacy of Sanchez, who was elected by the parliament after ousting former premier Mariano Rajoy in a no-confidence vote, the far-right and conservatives parties contested the same Constitution they claimed to defend. All three political parties leading the protest – PP, Ciudadanos and Vox – have been fueling tensions by increasingly using a confrontational language. Even with limited representation, the far-right have managed to shape the political agenda with their incendiary narrative. The Catalan dispute is just an example but women, LGTB or refugees’ rights are at stake. And extremist parties have shaped the agenda partly by being increasingly legitimised by supposedly right and centre-right political parties. We have seen this in Europe before. “In a moment like this, silence is an act in itself,” French Nobel Prize winner, writer Romain Rolland, wrote in a letter in 1914. Conservatives are not only remaining silent to the hatred being spread by far-right forces in Europe. They are aligning with them. In June 2018, when Austrian Chancellor Sebastian Kurz addressed the European Parliament to present his country’s presidency of the EU, Green MEP Philippe Lamberts criticised his government coalition with far-right FPO. “I have never been scared by the far right parties; but when their ideas contaminate those political families that once were the pillars of a democratic Europe, we are all in danger,” he told Kurz. Today it is Austria, tomorrow it can be Spain, but as elections approach and right-wing forces keep rising in the polls, in May it could be the European Parliament too. We are not there yet, but conflicts do not materialise overnight. Europe should confront far-right narratives before it is too late. Europe’s liberal party welcomed new members to its ranks in their Berlin meeting as battle lines begin to be drawn ahead of May’s European elections. Meanwhile, the French left struggles to find unity. Hungary’s PM Viktor Orbán launched his European elections campaign calling for voters to defend “Christian” nations against immigration, which he said led to the “virus of terrorism”. Brussels, city of spooks? “Hundreds” of Russian and Chinese spies have been planted in and around Brussels’ EU quarter, according to officials at the European External Action Service. European Defence Fund talks reveal the rift over the EU’s defence future. Despite a nine-hour negotiation session last week, EU lawmakers failed to remove doubts and seal an inter-institutional agreement. Post-Brexit Britain should be ready to use ‘hard power’, says UK’s defence minister. Britain and Switzerland are also set to sign a post-Brexit trade agreement. Global Britain, ahoy? Italy’s populist leaders promised to replace top officials at the country’s central bank, who they said must pay for failing to prevent a spate of banking scandals in which thousands lost their savings. The EU needs an ambitious Cohesion policy to achieve SDGs, the socialists argue. The Future of Europe debate with Italian PM Giuseppe Conte in the European Parliament session in Strasbourg.